Look! There it is! It’s perfect! Do I look good, mom? *** Please read the 4 simple guidelines above before you post your link – thanks! Hi Jenn.. if you could please remove one of the links of mine in the Hooked by Haiku list, and update my address to http://artofleo.wordpress.com/ :) The present link goes to my old URL. For the first time, I’m early! Everybody must be busy with all the challenges taking place in April. Anyway, happy to be here every Wednesday. I’m sure glad those days are over! 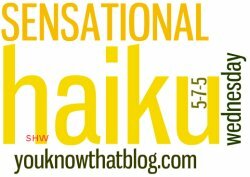 Love your series of Haiku. They bring back memories. I’m in. I wrote a few fun ones that I think will give you a laugh. Hi Jenn! I’m glad you still host SHW! I haven’t posted in several years but I’m glad I still remembered now that I am back to blogging! I love the colors of the dress your daughter picked, I’m glad I have ~13-14 years before I have to deal with that ritual! 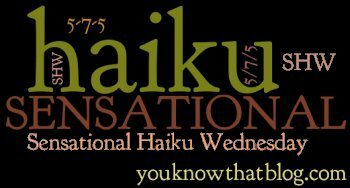 Thank you for another week of Haiku fun! I love your haiku series even on such an everyday theme like shopping with your child!! !